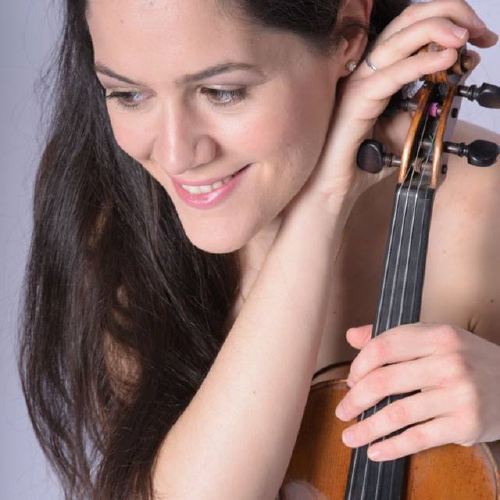 Born in 1987, Marie-Claudine Papadopoulos studied the violin under Ana Haas and Alexis Galpérine at Strasbourg’s National Conservatory, where she graduated with the highest distinction (gold medal) at the age of 14. In 2002, she began studying under Ulf Hoelscher at Karlsruhe’s Musikhochschule, where she obtained a Masters degree in 2011. Since 2012, she has been attending soloist classes under Roman Nodel at Mannheim’s Musikhochschule. She is currently attending the 3° cycle “Diplôme d’artiste” at the Conservatoire National Supérieur de Paris. In May 2012, she was awarded the 1st prize at the “Ton und Erklärung” (sound and explanation) competition, held by the Deutsche Wirtschaft, in Munich. Marie-Claudine was laureate and finalist of numerous international competitions, including the DAAD-Preis, the Felix Mendelssohn-Bartholdy competition, the Oldenburg Promenade and the Henri Marteau competition, where the jury awarded her a special distinction for the best interpretation of works by J.S. Bach. In 2011, she obtained the first prize at Neustadt’s Spring Academy, which awarded her a performance with the German State Philharmonic orchestra of Rheinland-Pfalz. Marie-Claudine performs as a soloist with numerous orchestras, including the Münchner Rundfunkorchester, the Göttinger Symphoniker, the Sinfonia Varsovia, the Deutsche Staatsphilharmonie Rheinland-Pfalz, the Capella Istropolitana orchestra, the Orquestra do Norte, the Kurpfälsisches Kammerorchester, the Schlesische Philarmonie, and the Slovak Sinfonietta.She has worked with numerous prestigious conductors, including Volker Schmitt-Gertenbach, Christoph Müller, Klaus Arp, David Geringas, José Ferreira Lobo, Kaspar Zehnder, and Andreas Henning. In parallel, Marie-Claudine is active with several chamber music ensembles and has performed in numerous festivals across Europe, including the summer festival in Heraklion (Greece), the “Murten Classics” (Switzerland), the “kammermusikfestival” in Thy (Denmark), the “festival jeunes talents” (Paris), the “Giovanni Artisti” festival in Cervo (Italy), and the “Schloss Solitude” in Stuttgart (Germany). Her fellow chamber music colleagues include Arnulf von Arnim, Gustav Rivinius, Jean Sulem, Wolfgang Boettcher, Davide Formisano, Elisabeth Zeuthen Schneider, Craig Goodman, Herbert Kefer and Ulf Hoelscher. Passionate about teaching and driven by the urge to transmit her love for music, Marie-Claudine created in 2008 together with the cellist Alexandre Vay the Summer Academy for Chamber Music in Trouville-sur-mer, where she teaches every summer. She is sponsored by the Fondation Meyer and the Rotary Club. In 2008, she obtained the prestigious prize of the Kulturfonds from Salzburg, and performed in Mozarteum concert Hall. Marie-Claudine plays since 2016 on a N. Amati violin, graciously lent to her by a private collector.